Spaghetti alla Carbonara is the quick pantry meal some cooks turn to when pressed for time. This variation combines all the familiar flavors but is particularly helpful for those who feel discomfort eating eggs which have been cooked only by hot pasta. This is more a description of a process than a recipe. You may need to do a little multi-tasking. Begin by frying some chopped bacon (or pancetta), at least one slice per diner, you can cook more if you like. Remove the cooked bacon and reserve for later, saving the skillet for frying eggs. Using spaghetti or another variety of flat pasta cook the amount of pasta you plan to serve until it is slightly underdone since residual heat will allow it to continue cooking. Before draining save approximately a cup of the cooking water. Return pasta to pot and add about 1/2 c of the reserved pasta water and about 1/2 c of grated Parmigiano (per pound of pasta). Stir until the cheese has melted and coats the pasta, adding more pasta water to keep the dish moist but not runny. Season with salt and pepper and add the bacon pieces, tossing to mix well. In the bacon grease, fry as many eggs as you need for diners.When the eggs are done (for this application they are a bit better runny, but it is your choice) make a mound of pasta on each diner's plate. Top with an egg or two, more Parmigiano, and chopped flat-leaf parsley, if you have it. Encourage each diner to break the egg yolk and toss their pasta lightly to mix in the egg. With my most recent pregnancy, I ate a special treat every day that I was overdue; I posted a picture of the treat to Facebook to let friends know that the baby hadn't been born yet. I was five days overdue when we ate Anybody Want a Peanut? Bars, feeling extremely uncomfortable and like I was going to be pregnant forever. 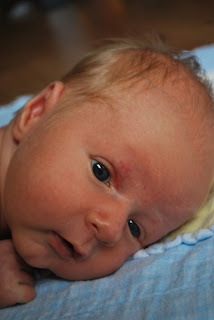 The following day, I went to the hospital for a non-stress test and was then admitted to labor and delivery. This beautiful baby's nickname is still "peanut," because we did want a peanut! And he came. Essentially a homemade candy bar, this treat is called a Goody Goody Bar by Cook's Country Magazine. I made it for Betsy during the overdue days of her last pregnancy as a comfort for us both. At the time, Betsy's family was enjoying references and quotes from the movie Princess Bride. So we renamed the bar in its honor. When I was in my late teens my mother came across a recipe for "Special K Treats" which, with their peanut butter flavor, gave some variation to the "Rice Krispie Treats" our family ate from time to time. In my high school and college years I must have made Special K Treats a thousand times, so when I found the recipe that follows, I knew it had an ancestor in common with my family's quick snack. This recipe uses brown sugar for extra flavor and chopped peanuts, too, which also add crunchy texture. I decided to try a cereal flake made of whole grains (I used something called Flax Plus which ingredient list included whole wheat flour, the bran of several grains, etc.) rather than the cornflakes and found I liked them and it helped relieve my ambivalence about all the sugar in this recipe. I've topped the bars with semi-sweet and bittersweet chocolate and prefer the bittersweet variety (I used Guittard brand) although it had less viscosity. I also tried some with coarse salt sprinkled on top (so much for my concerns about "healthiness"). Butter a 9X13 baking dish. In a large saucepan, cook the sugar and corn syrup until simmering and the sugar has dissolved, stirring occasionally. Don't let this simmer for long because the temperature will rise and the sugars will start to become harder candy (definitely not what you want in a "chewy" bar). Remove from heat; add the peanut butter and the peanuts, stirring until fully incorporated. It will still be lumpy because of the peanuts. Stir in the cereal flakes and stir until well mixed in. Without delay, scoop mixture into the baking dish and spread out using a rubber spatula to compress making sure you press well into the corners. Smooth the top somewhat. Melt the chocolate by microwaving in a small bowl for 30-50 seconds, stirring to smooth. Don't allow it to microwave too long. The chips can look unmelted but are so hot that stirring will quickly turn it into a sauce. Spread melted chocolate on the top of the bars and let sit at room temperature for 30 minutes to set up. These are best eaten in a couple of days--they begin to harden and the chocolate starts to bloom if they sit around a long time. Late last summer I tried this at Betsy's house with strawberries from my garden. The recipe has been formulated to increase the flavor of the mousse when using supermarket berries which aren't always as strong in flavor as garden berries. I feel certain it will work with any fresh strawberries you can find. I've recently tried it again. Like a number of Cook's Illustrated recipes, the end result is very tasty but the process is somewhat fussy and requires a lot of dishes and pans. In spite of that fact, make the mousse and be glad you've got a dishwasher. Slice or dice enough strawberries to equal 1 cup (at least) and keep refrigerated until ready to use as garnish (or reserve enough for this purpose and cut berries just before serving). Pulse remaining strawberries in a food processor in 2 batches until most pieces are 1/4 to 1/2 inch thick, although some larger pieces will remain and will be fine. Transfer chopped berries to a bowl and toss with 1/4 c sugar and salt. Cover bowl and let strawberries stand for 45 minutes, stirring occasionally. Don't clean your food processor but use it for future steps. While reducing the juice, return the chopped berries to the food processor and process until smooth. Strain puree through a fine-mesh strainer into a medium bowl, pressing on solids to remove seeds and pulp (you should have about 1 2/3 c puree). Add strawberry puree to juice-gelatin-cream cheese mixture and whisk until incorporated. Using a mixer whip cream until it forms soft peaks. Gradually add the remaining 1/4 c sugar and whip until stiff peaks form. Whisk whipped cream into the strawberry mixture until no white streaks remain. Portion into dessert dishes and chill for at least 4 hours or up to 48 hours. 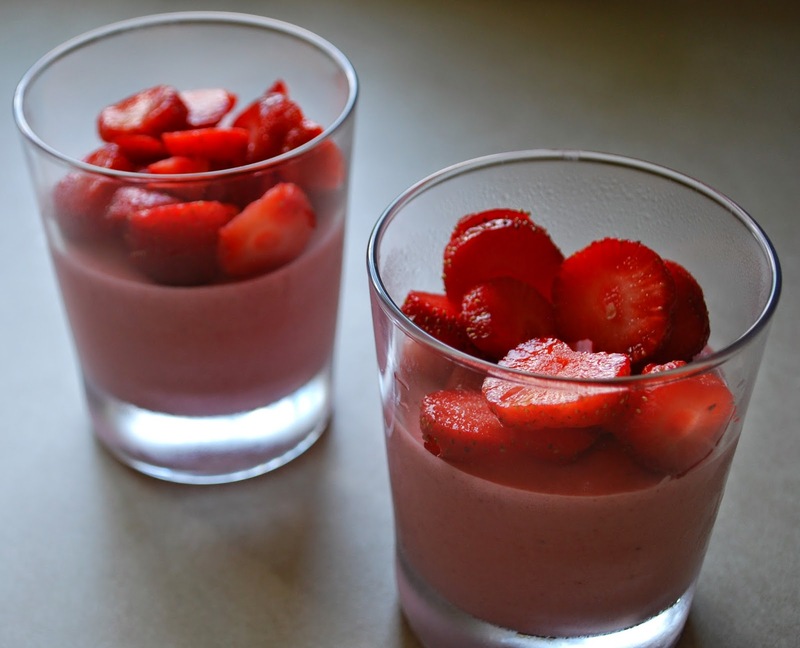 (If chilled for longer than 6 hours, let mousse sit at room temperature for 15 minutes before serving). Top with chopped or sliced berries. If you like the berries to be glazed with sugar, macerate them for 15 minutes or so before placing them on top of the mousse. Personally, I think this step is unnecessary and would make the dessert too sweet.